There is something about American music, as Leonard Bernstein said, in its expression of “wide open spaces” that describes an innovative mindset, a resilient optimism and a bold spirit of our people. At its roots, American music draws from the influences of many that have migrated here, willingly or against their will, as well as from native people that were already here. After four centuries, American music has evolved to express that which binds us– an identity uniquely our own. But, because there is a misconception that the accordion is not an American instrument, it has been passed over and seldom allowed, in recent years, to participate in the expression of that identity. 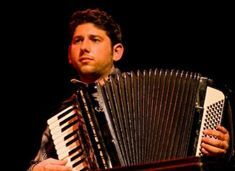 Outside of Texas and Louisiana, two regions that have their own strong music identities, the accordion has been rarely heard in most of American music, within the last fifty years. Currently, the piano accordion, especially, is not represented in American Roots music, at all. 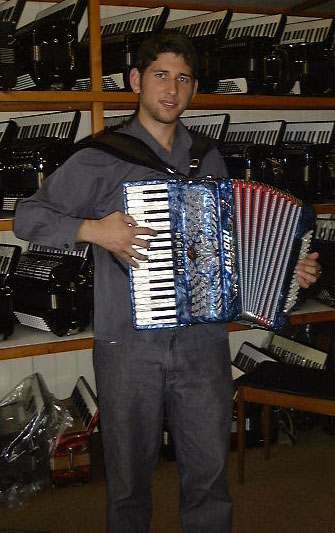 Today, so obscure in mainstream America has the accordion become that, some think of it as though it never existed, here. This is in spite of the fact that it has been in this country for well over a century and was an enormously popular instrument in the first half of the twentieth century. Edward Jay, an Accordionist specializing in folk music, performs with the accordion right in the “wheelhouse” of American Roots music along with Violinists, Fiona Barrow and Oliver Wilson-Dickson. By doing so, they show us that it’s finally time for the accordion to find its rightful place in American Roots music, once again. Born in the U.K. and raised in South Wales, Edward Jay began performing with his family’s band at the age of eight. His parents were part time folk musicians and their three sons were heavily involved with the family music. This was the training ground for Edward Jay allowing him to become a virtuoso accordionist and multi-instrumentalist in the folk tradition. Newfolks/The Beacons, comprised of Edward Jay and Oliver Wilson-Dickson, is a duo associated with Live Music Now, a program founded in 1977 by the legendary Violinist, Yehudi Menhuin and Ian Stoutzker. Newfolks/The Beacons leads folk music workshops and performs in a variety of venues across the U.K.
Contra Dance, or Contredanses (French) were actually English “Country Dances” popularized in the 18th Century. In time, these dances were brought to the United States as “Country Dances” although in New England they were referred to as “Contradances”. In the mid 19th Century, Contra Dance began to decline as couples style dancing, such as the waltz, became more popular. Auto Magnate, Henry Ford, had a role in revitalizing interest in Contra Dance because of his abhorrence for the jazz influence in modern social dancing. In the 1920’s he asked a friend and dance coordinator, Henry Lovett, to come to Michigan to begin a dance program. Lovett and Ford promoted the program in Dearborn, Michigan that included Contra Dance. Ford also published a book in 1926, entitled, Good Morning: After a Sleep of Twenty-Five Years, Old-Fashioned Dancing is Being Revived. It laid out the steps for Contra Dance. Since that time, Contra Dance has enjoyed a growing and enthusiastic following throughout the United States, promoted by folk music movements and preservationists. Fiddle is the predominant instrument in Contra Dance music. However, many instruments are brought together to be able to perform this genre of music. Just as with any type of folk music in North America, Contra Dance bands used whatever instruments were at hand. A typical Contra Dance ensemble is made up of three, four or five musicians with the fiddle, guitar, piano, mandolin or banjo, and flute or whistle being heard along with the accordion. Also, bass fiddles have been used, wind instruments of all kinds, auto harps, hammer dulcimers, ukes, and drum. An important resource for Contra Dance tunes is the extensive The Portland Collection, Books I and II, by Susan Songer. People in the U.S. don’t seem to realize that the accordion is not new to American music. It has been a part of our pioneer experience and has been in America since the mid 1800’s. It has been played, not only in the mountains and the bayous, but by folks in the city and in the country, on the prairie and in the desert, for a long, long time. It was used in American churches and schools, in taverns, at dances and social gatherings for over 150 years. Because it was portable, the accordion was used when pianos and organs were too heavy or delicate to transport. Accordions continued to participate throughout the 20th Century, along with pianos and organs, fiddles and guitars. It was used in the early Blues and every American genre of music until American accordion players decided, for whatever reason or influences, not to play American music. We must recognize that this is not acceptable, and work to correct it. The accordion is a critical piece of our music history and we should be proud of that connection, celebrate it and hold the accordion in high regard because of it.